The slopes of Mt. Crested Butte echo with the sonorous tones of a 14-foot- long alphorn. 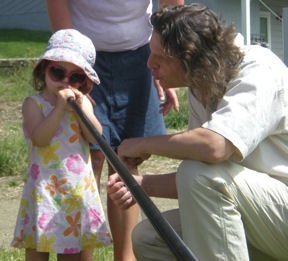 Not a Ricola cough drop commercial but one of the world’s foremost professional alphorn players – Arkady Shilkloper; plus, dozens of fascinated youngsters. The Divine Family Concerts are a yearly feature of the Crested Butte Music Festival. Aimed at younger audiences, the 2010 informal concerts included Brass for Kids, Bluegrass for Kids, Legends for Kids, a children’s opera – Hansel and Gretel, and Blow the Alphorn. Russian born Arkady Shilkloper started playing the alto horn at age six and spent seven years as a cadet at the Moscow Military Music School. Today he lives in Germany and plays horn, fugelhorn and alphorn with orchestras and small groups around the world. 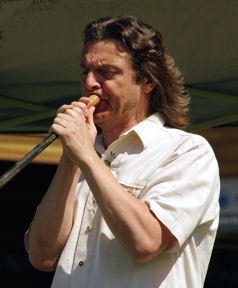 Shilkloper’s alphorn repertoire ranges from traditional Swiss songs to improvisational jazz. For the Divine Family Concert he included several of his own compositions including Alpine Trail and A Tribute to Crested Butte which he wrote after his visit five years ago. Then it’s time for eager youngsters to step up to the mouthpiece. Eyes pop when they successfully hit a harmonious note – or two or more. Shilkloper patiently encourages the shyest and those who initially struggle in their efforts. A five-year-old face-painted “tiger” immediately succeeds with a short melodic tune and is pronounced by the maestro as a natural. When others have difficulties Shilkloper asks the “Natural” to teach them in, “kid language”. One amazing three-year-old needed no instruction. 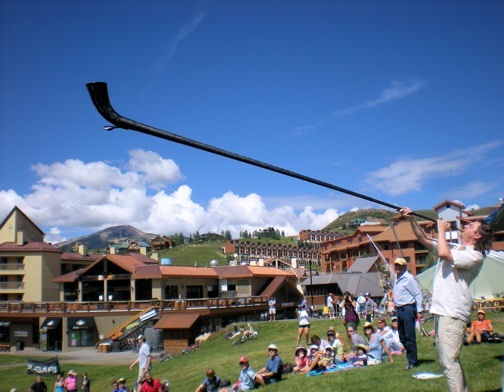 If a stockpile of alph orns were available there would be an entire alphorn orchestra on the slopes of Crested Butte. Arkady Shilkloper appears in a concert entitled Alpine Romance August 1, 2010 with the Crested Butte Festival Orchestra at the Center for the Arts. The Crested Butte Music Festival completes its 13th season in 2010. Each year programs and concerts present a wide variety of music styles – classical, chamber, jazz, bluegrass, opera, western and more.